One of the easiest ways to improve your cuppa is by grinding your coffee right before you brew it. Once coffee is ground, the volatile oils and aromas in the bean begin to evaporate at an extremely accelerated rate, leaving you with flat, stale coffee. 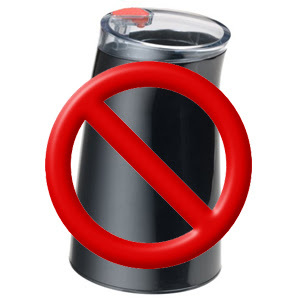 The best type of grinder uses burrs to slice the beans into consistently-sized particles, as opposed to blade-type grinders that leave you with everything from pebble-sized clods to dust. Why is this important? Because coffee dust makes your brew bitter, and oversize chunks don't allow the water to extract all of the flavor. 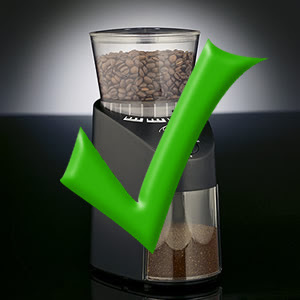 If you don't own a coffee grinder right now, I'd like to give you an incentive to to make the plunge a little easier. The good people at 1st-Line Equipment are offering a 10% discount on the Infinity line of grinders. Built by Capresso, the Infinity has sharp conical burrs that rotate slowly, thereby reducing heat buildup that can burn your coffee. If you'd like to take advantage of this offer (which, by the way, I'm making absolutely NO money on), click here and when you check out, enter the code "southernskies" in lower-case letters.